Dr. Hoster & Dr. Ewert continue to bring the most advanced technology to our patients by introducing the Optomap Retinal Imaging device. The Optomap captures an ultra-wide digital image of your retina (the delicate lining at the back of the eye, similar to film in a camera) to better evaluate your eye and systemic health. Typically does not require dilation, however, dilation still may be needed and is determined by your doctor. Instantly available for you and your doctor to review during your eye exam. Creates a permanent record to compare and track potential eye diseases. 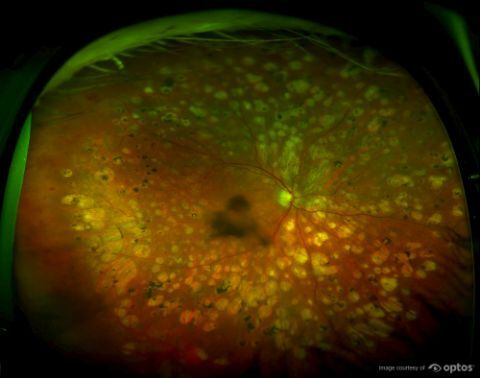 Captures a 200 degree image of your retina, this compared to a 45 degree view by standard retina imaging devices. Great educational tool for a better patient understanding of your eye and eye health.